The trade routes of Ancient Africa played an important role in the economy of many African Empires. Goods from Western and Central Africa were traded across trade routes to faraway places like Europe, the Middle East, and India. The main items traded were gold and salt. The gold mines of West Africa provided great wealth to West African Empires such as Ghana and Mali. Other items that were commonly traded included ivory, kola nuts, cloth, slaves, metal goods, and beads. As trade developed across Africa, major cities developed as centers for trade. In Western Africa the major trade centers were cities such as Timbuktu, Gao, Agadez, Sijilmasas, and Djenne. Along the coast of North Africa sea port cities developed such as Marrakesh, Tunis, and Cairo. The port city of Adulis on the Red Sea was also an important trade center. The major trade routes moved goods across the Sahara Desert between Western/Central Africa and the port trade centers along the Mediterranean Sea. One important trade route went from Timbuktu across the Sahara to Sijilmasa. Once the goods reached Sijilmasa they might be moved to many places including the port cities of Marrakesh or Tunis. Other trade routes included Gao to Tunis and Cairo to Agadez. 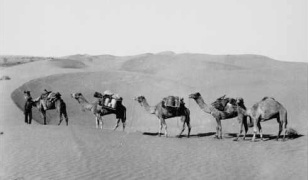 Traders moved their goods across the Sahara in large groups called caravans. Camels were the main mode of transportation and were used to carry goods and people. Sometimes slaves carried goods as well. Large caravans were important because they offered protection from bandits. A typical caravan would have around 1,000 camels with some caravans having over 10,000 camels. The camel was the most important part of the caravan. Without the camel, trade across the Sahara would have been next to impossible. Camels are uniquely adapted to survive long periods without water. They also can survive large changes in body temperature allowing them to withstand the heat of the day and the cold of night in the desert. Camels were first domesticated by the Berbers of North Africa around 300 CE. With the use of camels trade routes began to form between cities across the Sahara Desert. African trade reached its height, however, after the Arabs had conquered North Africa. Islamic traders entered the region and began to trade for gold and slaves from Western Africa. The trade routes remained an important part of the African economy throughout the Middle Ages until the 1500s. Before a trip across the desert, camels would be fattened up to prepare for the journey. The religion of Islam was spread throughout Western Africa through Muslim traders. Islam helped to encourage trade because it lowered crime rates through Islamic law and also provided a common language (Arabic). Muslim traders who lived in West Africa became known as the Dyula people and were part of the wealthy merchant caste. Camels have a double row of eyelashes to protect their eyes from the sand and the sun. They can also close their nostrils to keep out the sand. It took the typical caravan around 40 days to cross the Sahara Desert moving at around 3 miles per hour.